Website security is very important nowadays. If you do not secure your website then lots of chances to get hacked by hackers. In these days cyber attacks are rapidly increased because some peoples do not pay attention to the security of their website or they are compromised with security. If you are running a website that is powered by WordPress then you have to secure your site now because WordPress is an open source program, and hackers are always trying to find some flaws for hack websites. So if you are using the default setting in your WordPress website, there are so many opportunities the attackers can easily hack your website and they might be able to delete your data or they have some other way to harm you. If you never want someone to hack your website, then you have to protect your WordPress website using these activities, which I mentioned below. If your login page with a default user name like admin then you have lots of chances to get hacked by hackers. Because it is default setting and every WordPress user and hacker know about it and the hackers take advantage of that and attack on your site by bots and brute force attack. So if you want to secure your WordPress site then first change your user name and password. In your password, you have to use special characters and numeric and must be your password lengthy don’t use a simple password like ‘iloveu’ these types of passwords are easy to guessable. Many peoples do these types mistakes and after hacked they face lots of problems and struggle to get back his website. So if you want to secure your site from hackers so give your first priority on security. This is another security layer you can add to your WordPress site. The default login page URL of WordPress website is the main reason to get hacked. The hackers easily access your login page and then they start trying to guess username and password to unauthorized login. So if you are using default login page that is ‘https://somewebsite.com/wp-login’ then change it now. You can change login URL by two ways. first, directly login in your hosting cpanel then go to your WordPress install apps setting and change your URL. and the second thing is that is a much secure and easy way. install ‘wps hide login’ plugin and after installation goes to your setting option and click on general. Now a general setting page is open. Go to the bottom and here you get an option to change your login page URL (that is shown in the picture). Choose what you want and save it as login URL. Now you have to do fix another setting option that is a membership option. here you can deselect option if it is select. This is another strong main reason to hack your website by the hacker. They take advantage of this option and through that, they can make an unauthorized account and enter on your website. When you installed WordPress this option is enabled by default. To change the setting go on setting option and click on a general option. After few second new page will be open. Now find the option that is Membership option ‘Anyone can register’ now you have to de-select (disable) it. after that disabling this option you have to set another thing is called New User Default Role. you can choose here author or editor option which you want. You can also install a plugin to protect this option. User blocker is very good plugin to control unauthorized users accounts. In it, you can block the user or delete their account permanently. In your WordPress website, you must have to use limited login plugin. That plugin is secure your website from robots attacks and brute force attacks. Because if hackers attack your website through bots or brute force attacks and they start trying different combination on your login page to get unauthorized access.This plugin block that user who entered many times wrong password or username. In it, you can also set it how much times give chance to wrong activities. This always protects your website from attackers, who trying to access through guessing username or password. To install this plugin find limited login plugin and install it and activate it. After activation, you can setup it. Install firewall plugin to secure WordPress site. This plugin is like a lifeline of every wordpress user. All that plugins and features are added in this one plugin that I mentioned above. The plugin name is wp security. In this plugin, all features are added to improve security level. 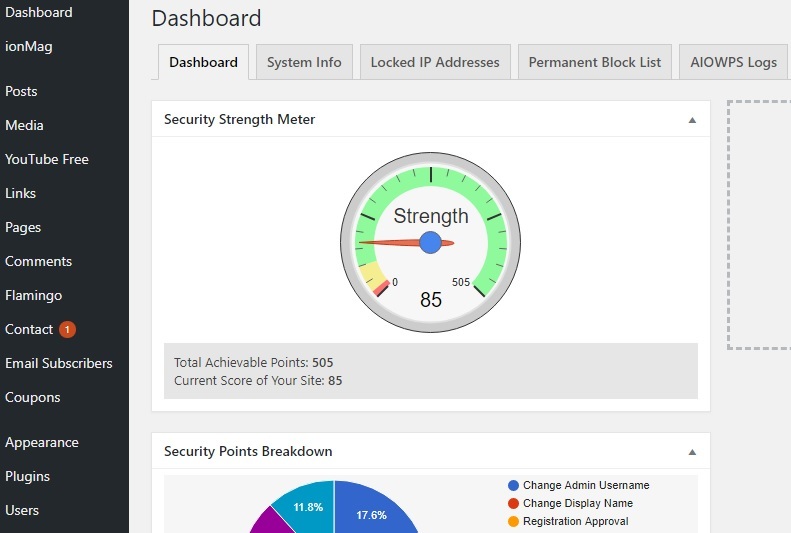 you can check your WordPress site security level in the meter that you see in the image. Make a backup of your website every week. Yes, backup is very important for every website owner. Because sometimes comes bug on your website or some error comes on it and you started to finding maybe it takes 1 minute or take 1 week to solve it. But if you have backup you can easily restored your all data easily in just few minutes. Sometimes by accidentally lost your data in that condition backup can help you to get your all data back. So if you running a website or some blog then make sure you are making backups every week. 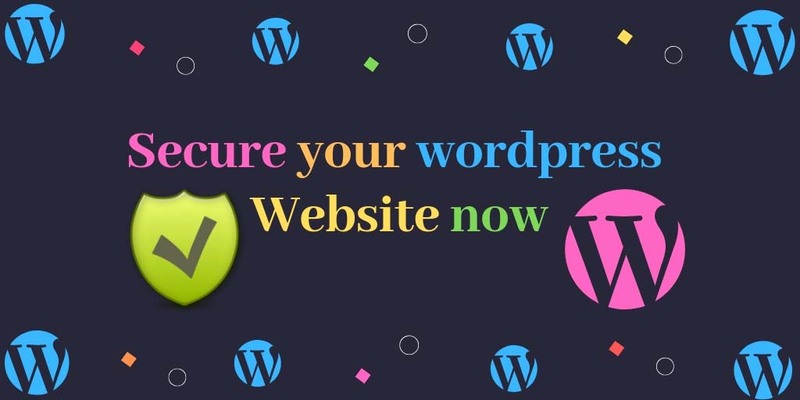 In this post, I told you about how can you make secure your WordPress blog by just using some plugins and after making some changes your default settings. You can protect your website by changing login URL, by disabling anyone can register option or by changing the spam protector plugin. Guy’s, security is very important these days. Every day some scam are happens on the internet. So make sure your website is secure and up to date. Because some peoples are does not update their wordpress version or plugins. In every update some features are added and bugs are fixed. In the research we find many websites owners doesn’t updated their wordpress or plugins versions. And hackers are take advantage of that and they hack websites. So guys I hope you can understand by this post and you learn something from it. If you like this post, then share it with your friends and social media platform to aware more peoples about website security.